Bobbie did not fully understand that there was a Revolution in her country, which had started in the capital city of Budapest and spread to Mosonmagyaróvár. People in Budapest were fighting the Hungarian secret police and the Soviet troops, who were sent in to help crush the Revolution. 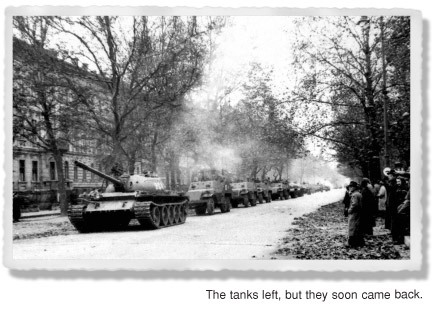 Then everything changed, and the Soviets started pulling their tanks out of Hungary. It looked as if the Hungarians had won the Revolution, and people all over the country were celebrating. Bobbie’s hometown, which is less than six miles from Austria, suddenly became a way station for hundreds of journalists from the West, who flooded across the border to record Hungary’s victory over Communism. After six glorious days of freedom, however, the Russian tanks came back. 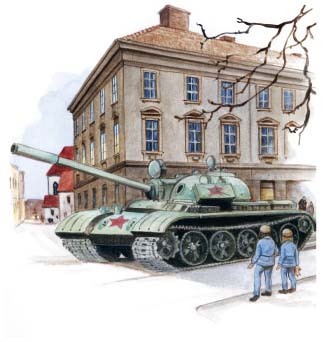 Bobbie was shocked one morning to find a huge tank parked right in front of her apartment building!